A novelization of the major motion picture! 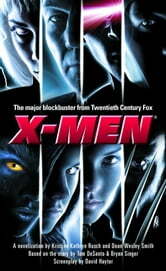 Outcasts from society, the X-MEN are genetic mutants, born with superhuman powers, who harness their special abilities for the greater good. But the human race they fight to protect rejects and fears—even hates—them. Not all mutants seek to protect mankind. One terrorist group—led by the supremely powerful Magneto—seeks to strike first. Battling against prejudice and agents of intolerance, the X-MEN must establish a peaceful coexistence between mutant and mankind or they will surely perish . . .